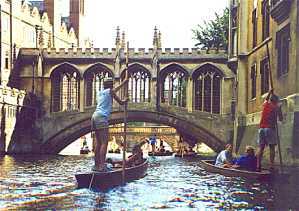 I was on the road in Mexico when I first heard about punting in Cambridge. I was talking to an English guy who had spent the summer propelling narrow boats up and down the river with a long wooden pole. “Does that still go on?” I asked doubtfully. Surely it had gone out of fashion along with bowlers and little woolly hats to keep the boiled eggs warm? A year later I found myself washing up on England’s shores once again, broke and without much idea of what to do next. Suddenly the vision of punting in Cambridge surrounded by fawning American girls came to mind. I got out the Yellow Pages. The boss of the punt company I phoned up was impressed that I spoke a couple of languages and he invited me to start working the next week. I turned up on a miserable spring day and was given a boat and a pole so that I could teach myself to punt. Apparently the main thing to do was to know when to let go so I didn’t get stuck in the middle of the river hanging onto the pole for dear life. This wouldn't go down well with the punters! 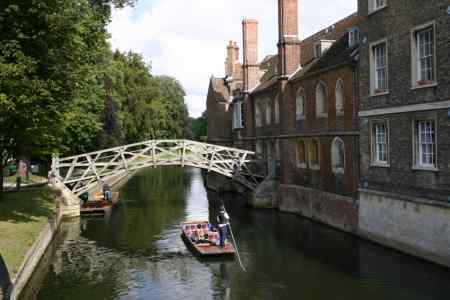 The River Cam is bordered by ancient college buildings and spanned by bridges of stone, wood and iron at the beginning of each new college grounds. I had my work cut out just making the damn punt go straight. 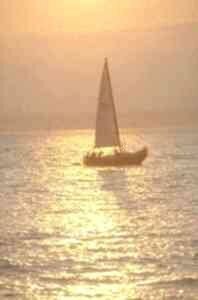 The fear of failure stood between my eyes and the beauty that surrounded me. Would American girls fawn over a guy stuck up a pole? What if I couldn’t learn to punt? What if I ended up maiming my passengers with the pole? What if the dreary expressions of the English drove me to end it all the murky waters of the River Cam? The icy water turned my fingers numb and dripped down the right hand side of my trousers. At first I couldn’t escape the clutches of the river banks and the overhanging branches of willow trees kept trying to drag me into the water. From time to time I’d get into the rhythm of things but then I would totally lose my confidence whenever other punts approached. Yet eventually I learned to go straight and could punt up and down the famous Backs of the colleges without fear. So the next step was to learn the spiel. 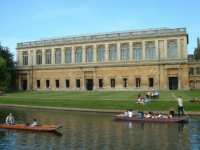 I studied some photocopied notes with all the dates and facts of Cambridge University and the colleges and memorized as much as I could, together with the old handed-down jokes. As a tour guide I was expected to know my stuff and I soon realised that, even if I had only just read about the history of the town on a rumpled old script, the important thing was than I believed what I was saying. So for the first few weeks I earnestly told my passengers that the University Library contained 65 million books; it was only after I was checking my notes that I realised that I’d missed the decimal point and there were actually only 6.5 million. Oh well. I believed it and so did they. It was quickly apparent the job was a cross between being a taxi driver and a stand up comedian. I’d have up to twelve tourists as a captive audience in the boat and at last I’d found my exhibitionist heaven; surrounded by freezing, dirty river water, there was nowhere for my passengers to go, no matter how bad my jokes got. I retold the same old stories to over 200 people on around 25 trips a week. In fact, it got so tedious retelling the same old script that I began to wholly invent new stories just to keep myself amused. 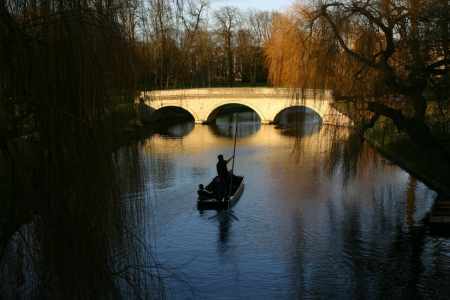 We got paid per trip, so on sunny days when everyone wanted to go punting, life was good. Heaving half-a-ton of mahogany plus half-a-ton of fleshy tourists up and down the river, we used muscles we never knew we had – but we got paid well and there are few places on earth more scenic to work. On the rainy days, however, everyone just scowled at us for even suggesting the idea of a punting trip and we’d hang around freezing, not even making enough for a warming drink. Then we’d mutinously grumble about the minimum wage and begin to hate the boss who was probably home drinking tea and running a hot bath. There are worse ways to make a living than punting in Cambridge for the season. There were times when the tourists drove me insane, my back left me in agony from pushing ungrateful passengers up and down the river, and I just couldn’t tell the same old stories and jokes any more. Try making a one liner sound funny 500 times a year. But then suddenly the light would change on the river and you’d see all the colleges and trees as though for the first time. The rose gardens that burned alongside the river banks in the spring, the lone days of June and July, punting until late in the evening and the falling leaves and red vine facades of September. 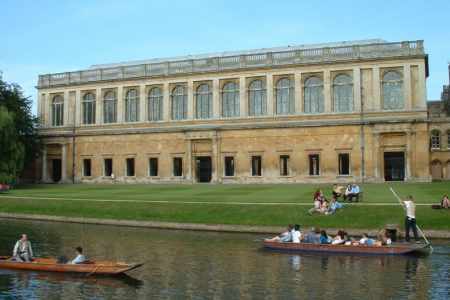 At its best there were few more beautiful places in the world to live and work than Cambridge. Take a punt tour yourself! If you enjoyed reading the above article then you will probably also enjoy Norway, also in Europe, and our latest articles covering the Orinoco Delta, La Mata, Marbella and Beijing.